The sky was looking iffy yesterday morning, but the girls and I headed out to the strawberry patch anyway, almost daring the clouds to rain on us. Chilly and overcast, the conditions turned out to be perfect for picking and photography. 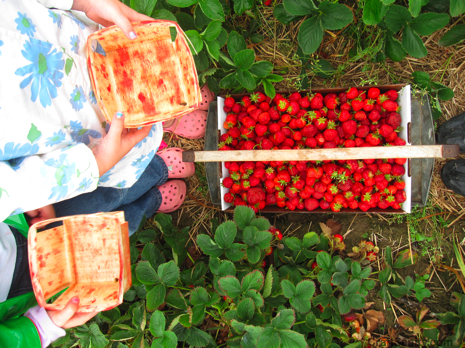 Within 30 minutes we had plucked 14 pounds of juicy berries from our assigned row in the field and were ready to move on to the ice cream stand and petting zoo. Watching my daughters running down the straw-covered pathways with berrry-smeared faces, I imagined that I’d really enjoy being a strawberry farmer. 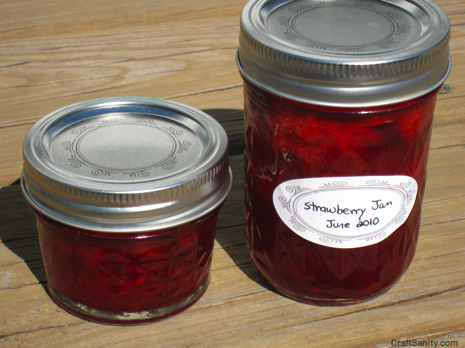 What fun to tend to a place for families to visit and children to learn where strawberry jam comes from. It was a good day. Turns out this was a good move. The jam tastes good and the girls love it, too. Hey There. I found your blog using msn. This is a very well written article. IÃ¢Â€Â™ll make sure to bookmark it and come back to read more of your useful information. Thanks for the post. I will certainly comeback. According to our research in the data recovery market, only one data recovery tools manufacturer has a complete solution for dead hard drives, that’s the repair and recover dead hard drives. Uh, James, possibly it is the definition of “natural.” – “Existing in or caused by nature; not made or caused by humankind.” How could something that is genetically modified be called “Natural?” Nature did not modify it, scientists did. Mit iPhoto ein Fotobuch gestalten Mittlerweile gibt es viele Fotodienste und MÃ¶glichkeiten seine Fotos zu entwickeln. Man kann verschiedene GrÃ¶ÃŸen und QualitÃ¤ten wÃ¤hlen und kann seine Fotos auch ganz leicht als Fotobuch zusammenstellen. Ein Dienst der dies anbietet ist iPhoto, den wir hier nun nÃ¤her vorstellen wollen. iPhoto lÃ¤uft auf jeden iPhone oder iPad. So kann ganz bequem auf der Couch vom iPad aus ein Fotobuch erstellt werden. 16/05/2011 – 8:18amYo creo que no es lo mismo que rebote en un defensa que en un jugador de tu mismo equipo. Si rebota en un defensa y entra, suele ser gol del que dispara, salvo que sea claramente gol en propia puerta. Pero si disparo y da en un compaÃ±ero, debe ser gol de este Ãºltimo, yo pienso que el gol es siempre del Ãºltimo jugador que la toca antes de entrar la bola, voluntaria o involuntariamente. For sure! I agree with that basic point. I guess I want to comment because I care a lot about women’s issues, especially internationally. I’m glad you read my blog too. dit :I do consider all of the concepts you’ve presented to your post. They are really convincing and will certainly work. Nonetheless, the posts are too brief for beginners. May you please lengthen them a bit from subsequent time? Thanks for the post. Nice selections! My friend wore the Asos dress to a wedding recently, but it was in pink, and it looked great in person. As far as shopping in San Francisco, the Cow Hollow area has a lot of great boutiques and shops. Have fun! Good point. You could pick up a 525 and a super duke for that kinda dough. I’m pretty sure this bike gets it’s awesome from quirky pseudo-oldness and exclusivity though. What i do not realize is in fact how you’re now not actually much more well-liked than you may be right now. You are very intelligent. You know therefore significantly in relation to this subject, produced me in my view imagine it from numerous varied angles. Its like men and women are not interested until itÂ¡Â¦s something to do with Girl gaga! Your own stuffs excellent. Always deal with it up! I donÃ¢â‚¬â„¢t even know how I ended up here, but I thought this post was great. I do not know who you are but definitely you’re going to a famous blogger if you are not already Cheers! I was a little confused about the article mentioning having social networking sites linking. Are they insinuating that if I have a blog post, for example, on my site, I should have those "add this" buttons on there so people can easily put a link to my article on their facebook page or delicious or one of those? always looking for new toys. i attend cat shows in the area and definitely go shopping for my 4-legged children. i also foster for our local no kill shelter and look to improve a fun time in their community cat room. Thanks a lot for sharing this with all folks you actually understand what you are talking approximately! Bookmarked. Kindly additionally visit my website =). We could have a hyperlink exchange arrangement between us!